Bold, friendly, self-confident and independent. May seem aloof. Large, not prominent, oval shaped, obliquely set. Dark brown in blacks, in livers brown tone to blend with coat colour. Chest deep with well-sprung ribs, oval in cross section with brisket reaching elbow. Forechest visible. Ribs extend well back into short, deep and powerful loin. Slight tuck-up to flank. Topline strong and level. 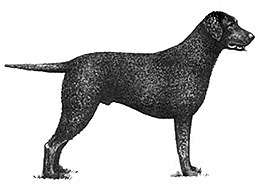 The dog should be slightly longer in body measured from point of shoulder to point of buttock than in height from withers to ground. Round, tight, with well-arched toes. Effortless, powerful gait with good extension and drive. Parallel movement. At speed legs tend to converge. Body coat a thick mass of small, tight, crisp, curls lying close to skin, extending from occiput to tip of tail; without undercoat or bare patches. Elsewhere hair smooth.